Well I have finally decided to start my sump/refugium design and feel I have chosen some products that will actually work as described. Since I have not purchased anything at this time I would greatly appreciate your advice on product quality and/or suggestions for better choices. Upgraded from a 65 gallon set-up to a 140 gallon set-up:b16: last June. Had the tank drilled for two 2" bulk heads on rear glass panel (Thanks for the advise). I will be adding two plastic containers measuring 15"Wx25"Lx18"H for a total volumn of 50 gallons. Both of these containers will be housed under the tank inside the cabinet stand. This container will be a refugium with a deep sand bed and live rock rubble (may also have cheato). 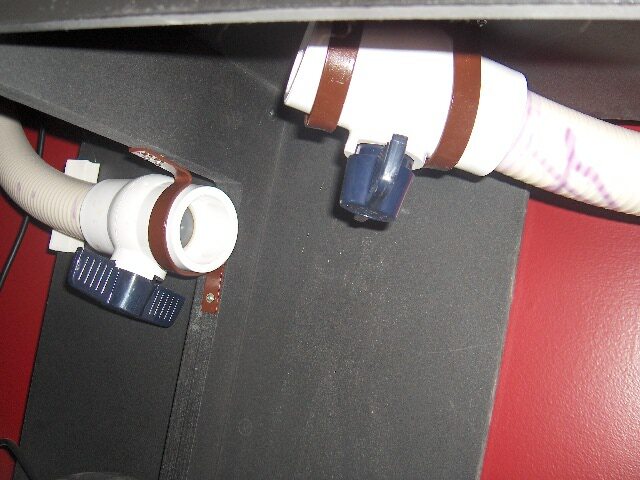 A dedicated "Quiet One" water pump (model#2200 @581GPH) will returning water back to the main tank through a 1" line. This container will be for the skimmer, heaters ect. and will have a dedicated "Quiet One" water pump (model#4000 @ 1,017 GPH). The pump will return water back through two 1" lines (may add new 1" SCWD). Both containers will be connected by a 2" pipe near top area to allow water balance during power outages/maintenance. Please see my (very) rough diagram of the refugium/sump set-up that I'am planning. You'll want your return water to hit your skimmer better. Right now your skimmer is at the other end past your return pump. 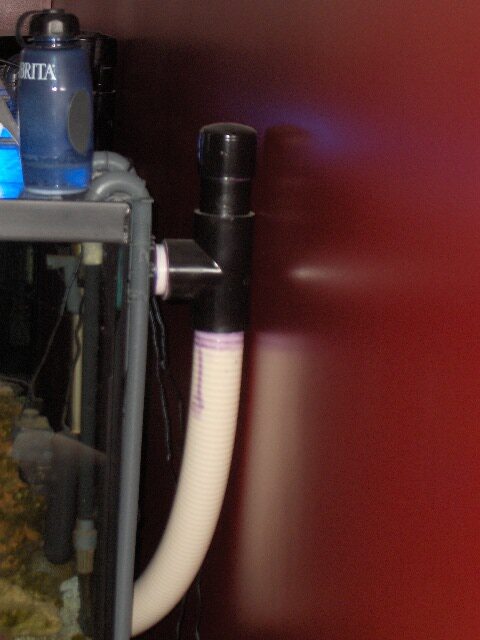 Most of the water being sent to your sump will just get sent right back where it came from without being filtered by your skimmer.... And I see you mentioned possibly adding a scwd. I've never heard anything good about them. what are the containers made of?? 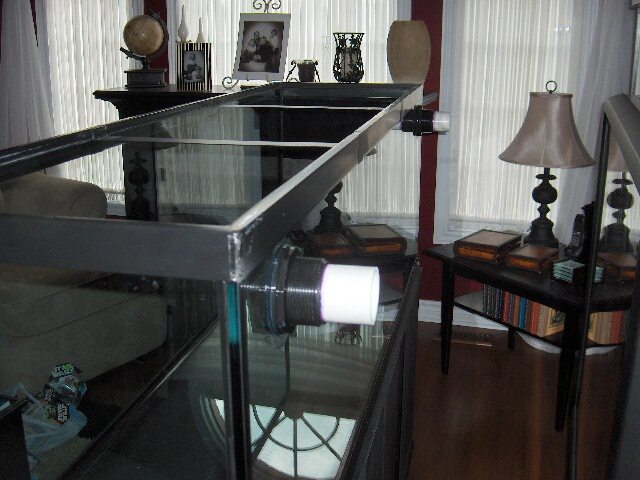 glass tanks may be a better choice depending on the material. why the two return pumps / containers? why are you using 2" pipe for all the plumbing?? what size are the drilled holes in the tank?? do you have an overflow planned?? can you post a pic of the drilled holes?? with the water coming down right next to the return pump and right next to the skimmer, micro bubbles in the tank will surely be a problem. Your return pumps are far to large IMO. Plus the quiet one pumps dont stay quiet for very long. According to your current plans you have 1600gph (without head loss of course) planned through a 50g sump. Thats way too high of a flow rate through a sump. I would agree, you only need the one return pump and not right next to the skimmer. Personally I would avoid the DSB in the fuge. quiet 1 pumps do stay quiet and for the price it has no match, good choice there. however, I would pick a smaller pump for the refuge. 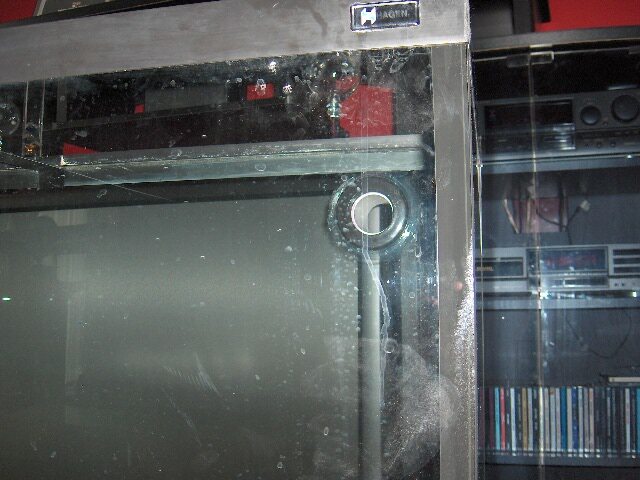 Due to the design of my aquarium cabinet I cannot run one large (long) sump since their is a centre brace for support with a small centre section that stays open. I was originally going to have only one container but wanted to add more water volumn to the system. The refugium is important since I would like to have a Manderin in the future. The two containers that I have found are made by Sterilite. I figured one pump per container to allow better control of flow from each side (slow on refugium and medium on sump side). 2" spa flex comes directly from the two 2" bulk heads which will feed directly into the sump. One line will then be "Teed-off" and reduced to 1.5 to feed the refugium. All lines will have ball valves to allow control. The skimmer can be moved with addition of baffles. Please see attached pictures of bulk heads. Skimmer choice sound good for size of tank? If I read your diagram correctly, you are planning to have two independent overflows, one running to each of the lower tanks. I don't think this is a good idea. Inevitably, one of the two overflows will be slightly higher than the other one. The water in your main tank will settle down to the level of the lowest overflow. As a result, there will be no water going into the higher of the two overflows and not water going to one of the two lower tanks. You could try and limit flow through one drain (not a good idea) or try to get the overflows really level (very hard and unstable with, at best, very unequal rates of draining down the two pipes). You would be better to have one overflow to drain into one tank. Connect that tank passively to the second tank (with one return pump in the second tank). 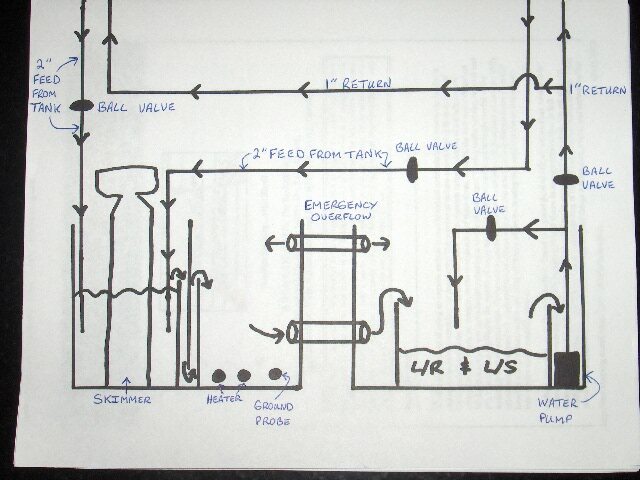 Or, pump water from tank 1 to tank 2 and return it passively from tank 2 to tank 1 with the return pump in tank 1. This might require having one of the two lower tanks raised higher than the other one. Thanks for all the feed back so far. I have re-designed my sump/refugium layout. I have taken your suggestions so far by adding more baffles, moving skimmer and using just one pump. Please look at new attached picture. What size pump should I use for this set-up. I thought the Quiet One water pump Model#4000 (1017GPH) would be considered on the smaller side in relation to what the two 2" overflows could produce? Also is the skimmer (Octopus Premium Series EXT-PS-150) that I have picked a good unit and of proper size for the tank? The flow rate in the main tank drain is determined by the capacity of the return pump, not by the drain size. As long as the drain is big enough (and 2" is fine), you don't need to worry. What size are the holes which have been drilled in the tank? A 2" drilled hole doesn't give you a 2" outflow - it would be more like 1 1/4". The plumbing connecting to the pump should be bigger than 1" (perhaps that is already planned). 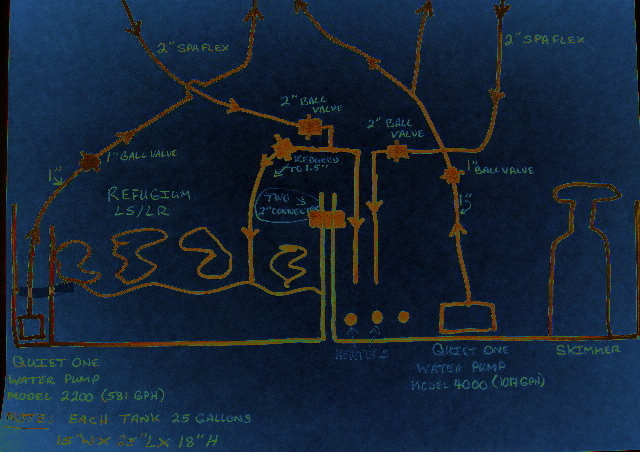 Looking at your diagram, your link between the tanks may not work as you hope. Water won't flow over the baffle in the right tank until it reaches the height of the baffle. That means that the water in the left tank will need to be higher than that (to provide a pressure gradient to push water to the right tank. Plus, since this is the only route to the return pump, the gradient will need to be large enough to push 600-1000GPH through the narrow tubing. My bet is that this won't work. I think you will need to raise the left tank higher than the right and provide a much larger overflow to the right tank. couldn't find it on the Coral Vue website but found one online. its a little under sized ( usually recommended to use 75% of manufacturers rating, 75% x 180G = 135G system ) and you don't need an external skimmer, it won't hurt but your paying more for that feature. in the same price range and rating you could get an octopus extreme 200 ( 250 even better :b12: ) which has a larger diameter.